The eponymous grandmother in question would be my paternal grandmother, who for as long as I can remember has been justly well-known for making this chocolate cake for every occasion. The recipe is thus intertwined with basically all my childhood memories of family holidays and trips to visit my grandparents – who lived in Milwaukee for much of my childhood. My copy of the recipe is on a rather yellowed recipe card in my mom’s handwriting. And today (at Carolyn’s request), you’ll all be welcomed into this family tradition! I’ll walk you through the recipe first and then discuss some of the (very minor) controversies. They’re nothing on the scale of Rufener’s versus Szalay’s, but there are choices to be made, nonetheless. Alternately add the flour mixture with the milk. 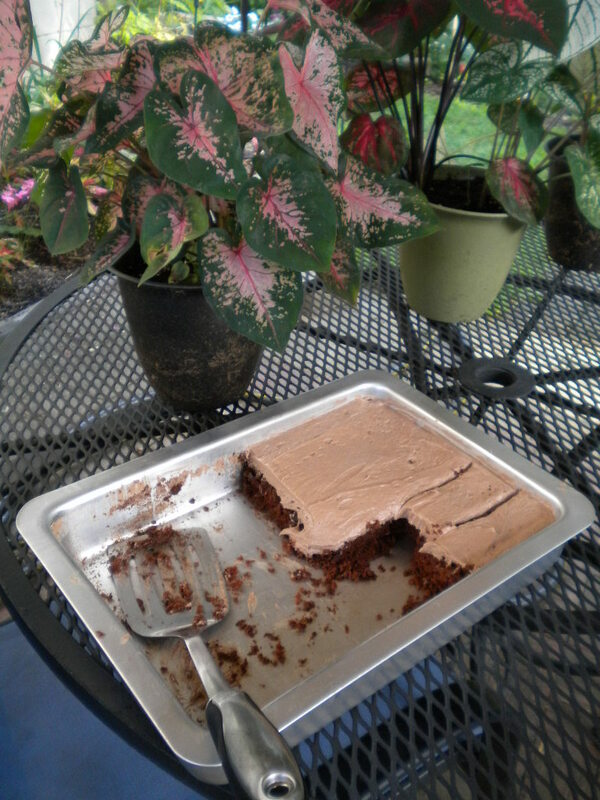 Pour into a greased 9×13 pan and bake at 350 for 30-35 minutes, until a toothpick comes out clean and the cake appears set. Alternately add 3-4 cups of powdered sugar and 3-6 T. milk. That’s it. Easy enough, right? I’m pretty sure grandma now practically does it in her sleep, and I know for a fact that she can squeeze in the work between hands of pinochle, whist, or whatever is the card game of the moment! 1. Everyone sours the milk differently. I use about a teaspoon of white vinegar, add milk to the measuring cup to the one cup mark, and let the milk sit while I blend the first ingredients. Others use lemon juice. Some people measure the acid, some just toss it in. Some use a full cup of milk and then add acid to that. Some insist on letting it sit longer. It doesn’t affect the flavor much, but you can’t skip souring it in some way! I’m not a food scientist, but I believe it’s necessary to provide acid for the baking soda. anyone want to back me up here? 2. Some people have been known to use butter in place of shortening. Or half butter, half shortening. Or butter-flavored shortening. Personally, I think shortening is the only way to go. Alter it at your own risk! 3. The flour measurement is goofy. Just go with it. 4. Chocobake is the easiest way to introduce the chocolate. You could melt squares or something else fancy, but why bother? Just skulk around the baking aisle at the grocery store to find their two boxes of Chocobake tucked away near the chocolate chips. One box is enough for two cakes, and God help us all if Nestle ever stops making it! 5. Speaking of chocolate chips, I’ve sprinkled some into the batter tonight. (Hopefully no family member gasps at this alteration.) I don’t know that it made much difference – perhaps it was a bit fudgier. Depending on your taste buds, you could probably explore adding nuts or peanut butter chips or any number of little additions. Why not? Make it your own. The real danger is that you’ll make the cake too often now that you have the recipe. It’s important to have a plan to rid yourself of it quickly. Thankfully, I was able to give away the vast majority of the cake tonight. (Note to GP: If you don’t get cake, it’s because Kim and Carolyn ate it all!) So welcome to the family tradition; I hope you enjoy! This entry was posted in Dessert, Recipe on August 12, 2011 by theneighborboys. I totally ditto the danger of this cake. It is my all time favorite chocolate cake! Whenever Tom mkes it I have a fork in it at all hours….that’s totally me he’s describing in eating it in the morning, at noon, at midnight….I LOVE it!! While I feel slightly guilty in asking for the recipe and receiving the recipe PLUS massive pieces of cake, I must say that it sustained us throughout the Nanci Griffith concert! Thanks so very much Tom! It really is my very favorite cake of all time! So thanks to Grandma Hanson too. Benji and Tionna were fortunate enough to stop over because they needed to give us their box for the CSA tomorrow since they are going to the zoo, and we shared cake with them. I promise to give GP the rest tomorrow, because each container held 2 generous and wonderful pieces! For the record, I will follow all of your directions to the letter and hope that I can do it right! My Mom always soured milk with white vinegar just like you do, so I will do that too. I agree with Jeff in that a glass of milk must be drunk with this cake! This may have been the best chocolate cake T and I have ever had! It’s almost midnight. I’m on my way. Don’t worry, I’ll bring my own fork. Ha I just returned to bed from my midnight snack…..yummy cake! I was not aware of this cake. Sounds wonderful and would go great with coffee for breakfast. Thank you Tom’s grandma!